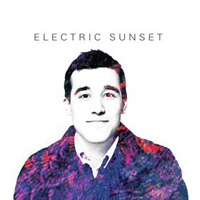 Both pastoral and a bit generic, the name Electric Sunset could have been spit out of a random indie name generator. But while the sun-dappled synths, warm guitar tones, and smeared vocals of Nic Zwart’s latest project are familiar building blocks, the sum total of this self-titled debut is more than mere pastiche. Zwart is best known as the frontman for the recently disbanded Desolation Wilderness, which had an unhurried, Galaxie 500-inspired delivery. Both of that group’s main albums, New Universe and White Light Strobing, were tranquil with suggestions of more exuberant, poppy songwriting either outright or under the surface. Zwart takes steps into more energetic and engaging territory on Electric Sunset, dialing up tempos and introducing driving interplay between stripped-down guitar melodies and synths. You can hear his musical progression on “Morning City”, with passages of echoing vocals setting up gentle peaks with crosscurrents of guitar. He still knows how to linger on a note, like the organ-like tones and bass hum of the slow burning “Soda”, but there’s more lift and propulsion with his solo project, airy instead of just misty. It’s soft-focus psychedelic pop that can feel suspended as it gets blissed-out, since Zwart’s simple and gradual rhythms don’t offer many surprises, and his voice, placed a bit back in the mix, could be more engaging. For every track that develops forward momentum– “Palace” recalls the bubbly sheen and exuberance of Atlas Sound’s “Walkabout”, and “Future Dream” also achieves a Bradford Cox vibe– there are parts that feel a bit restrained. Zwart’s melodies often settle into a slow-motion beauty, but as a whole they’d benefit from a bit more kick, a few explosions instead of just the big crescendos. The album’s nine songs clock in at a concise 32 minutes, but the impression they leave is more general. Created as Zwart moved from the northwest to San Francisco, Electric Sunset channels that optimistic feeling of the newly arrived, wistful for the past but relishing the blank slate. When he sings, “Lose myself in the cities/ Alone among many,” on “Prayer”, it doesn’t sound like a lament. But as peaceful as he comes across, it also doesn’t sound like he’s fully settled into his routine or his new sound.